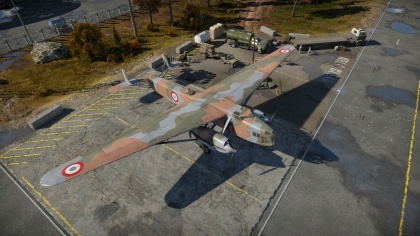 The N.C.223.3 is a Rank I French bomber with a battle rating of 2.3 (AB/RB/SB). It was introduced in Update 1.73 "Vive la France". The N.C.223.3, as a derivative of the Farman F.220 plane model, looks strikingly similar to the F.222.2 bomber, yet different as well. The biggest difference is the twin rudder on the tail that helps improve stability and yaw control. The plane's overall design was also made more aerodynamic as part of the improvement, the nose section is made a tad shorter, and the plane uses Hispano-Suiza 12Y-29 engines rather than the previous Gnome Rhone model. Defense armaments were also improved with two Hispano cannons as the rear ventral and dorsal turret armament. The N.C.223.3 is made distinctive with its push-pull engine configuration, stacking the engine on each side in tandem for the effect where the forward engine "pulls" the plane while the rear engine "pushes" the plane. This lowered the amount of engines having to protrude from the wing, while keeping the engine centerline so that one failed engine in a side will not prevent the other to provide a similar thrust force. In the default camouflage scheme, the N.C.223.3 is coated in the French standard aircraft tri-color camouflage, which consisted of Vert (Green), Brun Mat (Matt brown), and Gris Bleu foncé (Dark blue gray). The underside of the aircraft was painted in Gris Bleu Clair (Light blue gray). The French roundel is present twice on the left side, one on the N.C.223.3 fuselage and one on top of the wing. Final note of appearance is the French national tri-color markings on the tail plane and rudder. Like its predecessor, the F.222.2, the NC 223.3 is a heavy hitting bomber with okay maneuverability at low altitude and low air speed, and can carry a staggering 52x50 kg bombs. Combined with its frequent presence in Ground Strike matches with only light vehicles, it will make short work of any (or even all) groups of armoured cars and AAA it crosses paths with. However, the ability to carry larger bomb loads later in its upgrade tree turns it into an exceptionally capable base killer, often time wiping out bases solo. However, it is still capable of turning entire columns of medium tanks to flaming scrap if escorted in higher level battles. The N.C.223.3 currently has the largest payload available from any other Rank I bombers, rivaling even Rank III and IV heavy bombers. Engines away from the wing fuselage. Addition of takeoff flaps make taking off from a airfield easier than in the F.222. Somehow fast, despite it's size. Internal payload doesn't really affect it's performance except rate of climb. Can potentially win games by outright destroying the airfields when played in groups. Large wings but are not littered with fuel tanks. Default payload of 52x 50 kg bombs makes short work of artillery, light tanks, armored cars and trucks crucial to many games this bomber finds itself in. Low maneuverability at high speeds. 20 mm turrets don't carry a lot of ammo and have a very long reload. Tail design creates blind spots for gunners. You need to invest a large amount of crew points to be effective in the N.C.223.3, especially the gunners and reload time. 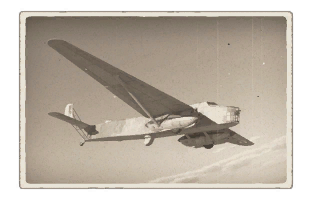 Being a Rank I, it has a 0.3 multiplier for SL rewards, so you will find yourself in a hard time earning SL with the N.C.223.3, despite it being able to earn a lot of it by base bombing. [Devblog] NC.223.3: let nobody leave unsatisfied! This page was last edited on 3 April 2019, at 17:19.